This is an Editorial and therefore are personal words ... but underlined with a Story behind. Like you know I was born in a Spanish-speaking country, Venezuela and my studies are far to be from Humanities because I got a degree in Mathematics in Venezuela, in 1986 and then I consolidate that degree in Italy, in 1992, getting good results. I dedicate also about 20 years to Computer Programming covering several assignations and I also works on Sales, before to found my small business company in Northern Italy that I move to Southern Italy about 8 years ago ... including more than two years of Venezuelan ... return, and therefore something like a "stand-by" with no business. In Venezuela I work like a Professor of Chemistry in High School as well organize a per-week Linux training based on my FTLinuxCourse. Yes! ... you read well, I say "Chemistry". I can tell you that any student comes to me for Mathematics, Physics, Chemistry as well English ... was approved in High School examinations or University. Now, why an English course? Because I feel I have an audience reading this I will tell you and list my reasons, there are many. The main reason is because English is a necessity, and not only for Business or for the Web, but like a Global Language, that is ... right now ... but is not ... really. If you agree with me that is a necessity then you will like my book. ... How many words are there in the English language? The Second Edition of the 20-volume Oxford English Dictionary contains full entries for 171,476 words in current use, and 47,156 obsolete words. Still listing resources about English Words from Organizations including Dictionaries we have that the WordNet from Princeton University (United States) offers solutions for about 1.4 Million Words and the best Windows interface is available at, http://www.ebswift.com. A Babylon Dictionary includes about 161,000 words and a Microsoft Words Dictionary to correct US English or British English offers about 49,000 words ... that may be added using the CUSTOM.dic file, a personal Dictionary created by the User. A standard Multimedia DVD may moves you to training to perfect about 4,000 words. In United States, the Brigham Young University Corpus of American English offers as many as 425 Million words at http://corpus.byu.edu/coca/. In England, the Oxford English Corpus is at the heart of dictionary-making in Oxford in the 21st century and ensures that we can track and record the very latest developments in language today. The Oxford English Corpus is central to the process and to Oxford’s £35 million research programme – the largest language research programme in the world. The Oxford English Corpus is a text corpus of English language used by the makers of the Oxford English Dictionary and by Oxford University Press’s language research programme. It is the largest corpus of its kind, containing over two billion words, exactly 2.5 Billions Words! The British National Corpus offers a DVD with 100 Millions Words and their relative program to search. The Logman Learners Corpus range on 10 Million words. A normal US College Dictionary offers a range of 200,000 words! ... and that is the main purpose of a "English for Beginners Book". ... But there are more ... You know there are beauty reason and this reason goes beyond the fact to want to teach English. But let me tell you the very reason ... The reason is that you can read the books written in English from Messengers like Godfre Ray King (which real name was Guy Ballard) and then the relay baton was given to Elizabeth Clare Prophet. I cannot express the love to read these words and how they have changed my life for no return. ... There are more ... Honestly there are more. I reach the very roots of the Shakespearean Plays ... because Francis Bacon was Will-I-AM Shake-speare! ... but he, Francis Bacon was also the son of Elizabeth I, Queen Elizabeth, and therefore ... for those like me, that are messengers of the Brotherhood of Light, we cannot but HONOR the Masters, and the Ascended Master in this case, is Saint Germain, very popular in France courts but also in all the European Courts, in the Century XVII and XVIII. Saint Germain still speak today ... thought mediums ... and now we back to English Language and Shakespeare. What is A Midsummer Night's Dream? ... is not but a Story about Ghosts and Forest Spirits? ... It is! What is Hamlet, Othello, The Tempest, Julius Caeser and Anthony and Cleopatra? ... May be these be "The Real Stories" commented by someone that was there ... or saw that stories in a Medianic travel? This is the Why ... I am work on this book-project. 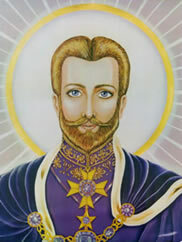 Still Saint Germain was also Merlin at Camelot ... but this is another story. into Spanish and Italian ... as well other languages is a sacred Gift I want to offer. This is not a Magic Book ... not at all, it teaches between other things, The Holy Bible ... and written by someone who was Joseph, the Father of Lord Jesus as well Roger Bacon the First English Alchemist and Scientist that was jailed ... is again a sacred covenant. PS. It is your free free-will to think and to feel that, I Giovanni am the messenger of Saint Germain (who was Shakespeare) to teach you English trough this book ... still to remain in England ... it is still your free choice that I, Giovanni am still the messenger of El Morya, who was King Arthur to motivate the Government of the World, like I did yesterday, releasing the magic words ... Encyclical on World GoodWill by El Morya Khan.